Arizona State University has established a new, interdisciplinary Center for Veterans’ Wellness to conduct research and help vets affected by combat-related stress and trauma, such as post-traumatic stress disorder (PTSD). The center launches at a critically important time, after more than a decade of war that has created a generation of combat veterans. The ASU center will build national visibility for research and treatment advances, bringing in scientists who have an accomplished record in veterans’ health research. Approximately 22 million veterans live in the U.S. today, more than 17 million of whom served during wartime. The stress and trauma of war can have a powerful effect on service members’ health and well-being. For example, 11 to 20 percent of veterans who served during recent wars have been diagnosed with PTSD, compared to 7 to 8 percent of the civilian population, according to the U.S. Department of Veterans Affairs. Crnic believes there are ways of easing the transition by delving methodically into the issue. “This center is a way to expand ASU’s military-friendly mission, to include contributions to the science that supports the well-being of our veterans,” said Sethuraman Panchanathan, senior vice president for the ASU Office of Knowledge Enterprise Development. Because the Center for Veterans’ Wellness is a university-wide, interdisciplinary effort, it will be supported by the Office of Knowledge Enterprise Development, instead of an individual college or school. As the center emerges, Davis and Crnic foresee important contributions from the life sciences, the social and behavioral sciences, social work, nursing, health solutions, law and other disciplines. In addition, many researchers at ASU collaborate with local health and social service organizations, such as the Phoenix VA Health Care System, Mayo Clinic, Barrow Neurological Institute and others. The new center will support and expand upon those kinds of community partnerships. In her own research, Davis focuses not just on eliminating symptoms of chronic pain but also on enhancing quality of life. She would like to see the new center embrace this approach as well, focusing not just on avoiding negative outcomes but also supporting positive experiences and connections. As the largest public university in the U.S., ASU already has a strong commitment to veteran success in education and has been named a “Military Friendly School” by G.I. Jobs magazine six years in a row. The university offers numerous support services to more than 4,400 military, veteran and dependent population students. These include the Pat Tillman Veterans Center, which provides a single point of contact for ASU veterans and their dependents; scholarships through the Tillman Military Scholars program; and VetSuccess on Campus, a joint program with the VA that provides academic, career and adjustment counseling. Los Angeles Mayor Eric Garcetti hosted ASU's Zócalo and KCRW's "My Favorite Movie" series at the Million Dollar Theatre in downtown L.A., Feb. 26. Ever wondered what makes Los Angeles Mayor Eric Garcetti laugh? 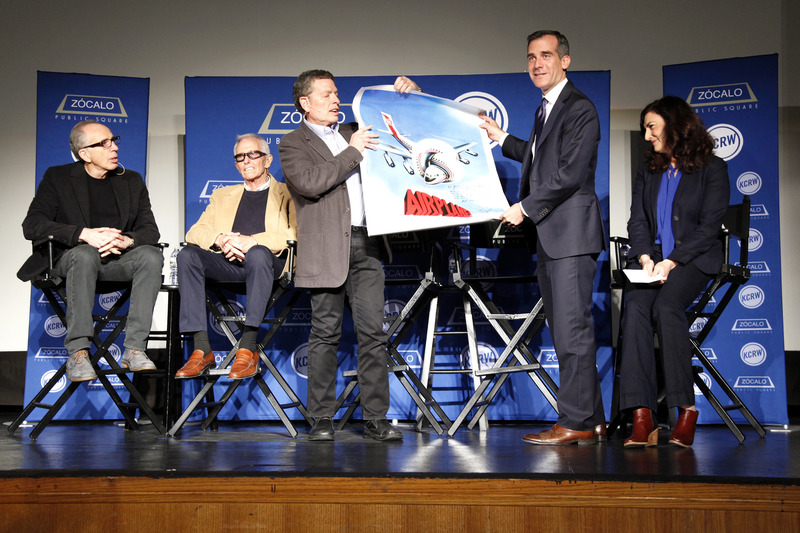 Garcetti hosted Zócalo and KCRW’s “My Favorite Movie” series at the Million Dollar Theatre in downtown L.A., Feb. 26. He chose the 1980 classic comedy "Airplane!" Zócalo is an affiliate of Arizona State University and is based at the ASU Center in Santa Monica, California. The Zócalo Public Square ideas project is a multiplatform, multimedia conversation that brings together thinkers, leaders, public figures and Americans from all walks of life to explore layered questions about how our nation’s past can help us understand its present and imagine its future. After a screening of "Airplane!" KCRW "Press Play" host Madeleine Brand interviewed Garcetti, as well as the movie’s writing-directing-producing trio, Jim Abrahams, David Zucker and Jerry Zucker. “It doesn’t seem incomprehensible anymore,” said Garcetti. He added, “There’s so many things you probably couldn’t get away with doing now” in the movie, yet it still feels fresh, he said. Garcetti said that he loves how the humor of Abrahams and the Zuckers “always seems well-intentioned” and comes from a good place. Garcetti said that when it came time to choose his favorite movie, there was some debate in his office; people thought he needed to choose a classic Los Angeles movie like "L.A. Confidential" or "Chinatown." But "Airplane!" is also an L.A. movie, he said. And it gets at some important issues of contemporary L.A. as well. “LAX hasn’t been improved since the movie,” said Garcetti. Brand asked the filmmakers if, when they made the movie, they had any idea it would become so iconic. “We were just excited that it did well when it opened, but never ever thought it would have this long a life," said Jerry Zucker. Jim Abrahams recalled that VHS machines were new at the time of the movie's release in 1980. They won an award for the world’s top-selling VHS – with around 25,000 copies sold. Brand asked why the filmmakers decided to cast against type, with leading men who were not known as comedians. “It was the only way we could do the movie,” said David Zucker. “We thought comedians would ruin it.” The idea was that it would look and feel like an old movie – but with voices that had been redubbed without the actors knowing it. The studio, Paramount, was a bit perplexed about the intentions of its three young filmmakers. But after executives watched dailies from the first day of shooting, which featured Leslie Nielsen’s most famous line in the movie, “I am serious … and don’t call me Shirley,” they finally got in on the joke. Brand asked how Lakers basketball great Kareem Abdul-Jabbar ended up in the movie. “That role was originally written for Pete Rose,” said Abrahams. But the movie was shot in the summer, and Rose was playing baseball, so they rewrote the part for Abdul-Jabbar. The movie was shot on a shoestring budget of $3 million and made $80 million domestically and $80 million internationally. This was very unusual at the time, said Jerry Zucker. But "Airplane!" traveled well because people around the world had seen the disaster movies it spoofed. The Zuckers and Abrahams love the very movies they make fun of in "Airplane!" “When we’re picking something to satirize, not only do we need to find something that we think is kind of laughable but also something that we have affection for,” said Jerry Zucker. Turning to Garcetti, Brand asked him how L.A. has changed from the city presented in the movie. Garcetti said that watching the movie, and recognizing how it changed humor – creating a deadpan, fast-paced rhythm that didn’t exist before – also reminded him of the more unformed Los Angeles of his childhood. The moviemakers gave Garcetti a signed poster, and asked him to read the inscription to the audience.